We are a group of earth and life scientists that have gathered to document the relationship between environmental and biotic change on coral reefs and shallow tropical marine ecosystems in the Indo-West Pacific. This region has contained the global center of marine species diversity for at least the past 20 million years, and we aim to collect the basic geological and biological information required to document the long-term history of extinct and extant components of this diverse biota. Our new data set will be used to better understand the structure and functioning of tropical marine ecosystems and will be applied to address ongoing issues associated with accelerating anthropogenic environmental change on local to global scales. Seagrass molluscs as palaeoenvironmental indicators: ESR Sonja Reich defends her PhD thesis with success. On the 24th of June Sonja Reich had her public thesis defence at the Utrecht University. She is the second ESR to complete her PhD thesis. Sonja's work is about molluscs associated to seagrass habitats. Such habitats are critical in the functioning of coastal ecosystems and currently under pressure. Since seagrasses themselves fossilize rarely but the accompanying mollusc faunas do, it appears they form a good model group to study the timing and context of diversification of shallow marine biota in SE Asia. 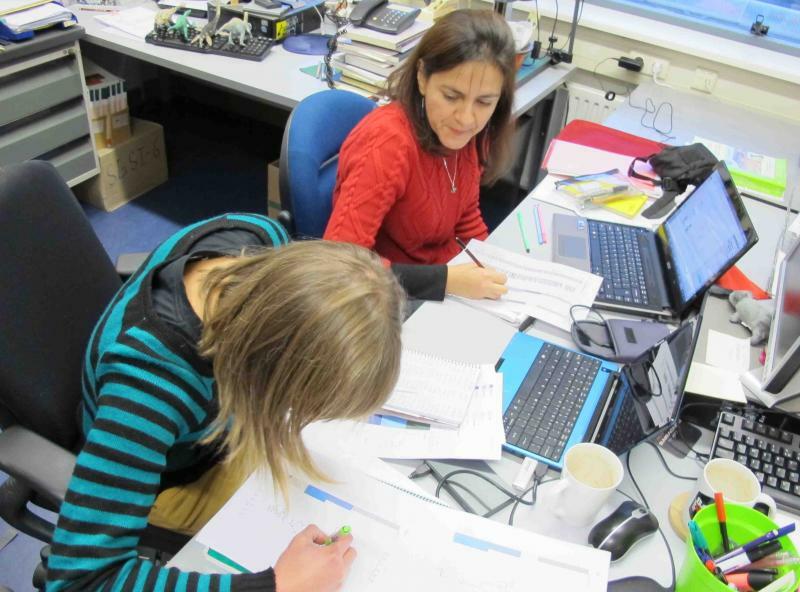 Sonja explored several ways to characterize and identify seagrass faunas, including trophic composition, geochemistry and taxonomic composition of faunas. Diversity in the seagrass habitats was already very high at the Early Miocene in the region. Congratulations to Emanuela Di Martino who became the first of the Throughflow Early Stage Researchers to be awarded her doctorate when she successfully defended her thesis on 'Cenozoic bryozoans from Borneo' at Utrecht University on 26 February 2014. In front of a public audience including members of her family from Sicily and several Throughflow researchers, Emanuela was questioned by six examiners for exactly forty-five minutes before the procter entered the hall, banged her staff on the ground and declared the examination over. After a short deliberation, the chairman of the examination board returned to announce the good news and the celebrations began. A formal reception at the university was followed by a wonderful buffet dinner at, appropriately, an Indonesian restaurant, enlivened by a special quiz devised for Emanuela by Nadia Santodomingo. The prize? A MacBook. Vedrana Pretković (Granada University) and Nadia Santodomingo (NHM London) visited Naturalis museum during the last week. A small meeting was arranged to discuss progress on one of our publications with the ESRs based in the Netherlands, Nathan Marshall and Vibor Novak. We also welcome our colleague Aries Kusworo from Indonesia, who is currently working with Sonja Reich and Frank Wesselingh on mollusks from the Bontang gardens. Great American experience for part of the Throughflow team at the GSA Annual Meeting in Charlotte! Six ESRs (Nadia Santodomingo, Vibor Novak, Sonja Reich, Nathan Marshall, Anja Rössler and Emanuela Di Martino) presented their results at the “Pantropical Paleontology of the marine Cenozoic” session, convened by Paul Taylor, Ken Johnson and Willem Renema. Our conveners and Jon Todd contributed also with very interesting talks, giving a broader overview of the evolution of marine biodiversity in the tropics.